Visit the download page to stream or download this release. If you’ve ever watched liquid trickling down-stream, you will notice that it doesn’t follow a straight-forward path. It changes direction randomly like dreams; like hallucinated thoughts pulling us away in various unconnected movements. That short, inching trickle of information will seemingly take hours of your subconscious time; yet with one fell swoop can change direction in an instant. The initial plot and story-line of your dreams are swapped sporadically for a new, more exciting destination of hallucinated thoughts. Dreams aren’t always subconscious sleep-scapes and dormant ideas. They can be conscious ambitions, hopes and objectives. With correct application, these can materialise into your reality. It is through procrastination that our dreams can eventually slip away as if you were clasping someone’s hand by the edge of a cliff. Drifting by into oblivion as each day passes. 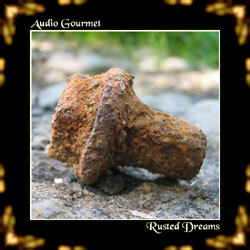 Visit the artist homepage: Audio Gourmet. This entry was posted in Catalog and tagged ambient, Audio Gourmet, Catalog, Netlabel, Releases by C.P. McDill. Bookmark the permalink.